Why are black holes black? Can a huge mass of humanity make the Earth wobble? And what’s so bad about space pollution anyway? Why are black holes black? Can a huge mass of people jumping at once make the Earth wobble? What’s so bad about space pollution anyway? What measurements do astronomers use to measure distances in space? Parsec = 3.08568025 × 1016 meters (distance from the Sun which would result in a parallax of 1 second of arc as seen from Earth. How can we tell the difference between gravitational pull between objects and the expansion of the Universe? Could energy condensed in a small space create a black hole with its own event horizon? If you had a flashlight in space and turned it on, could it propel you? How can you use degrees from Swinburne Astronomy Online and other online courses? The closer an object accelerates to the speed of light, the more mass it has; if an object accelerates away from the speed of light it should loose mass. Photons have no mass, so what happens? If a black hole can have spin doesn’t that imply that the mass distribution inside has a finite radius and not a true point singularity? Could we get the technology to look for planets around other stars and to see pictures of life on those planets and could they look back at us? Hi Pamela, another batch of questions – let’s roll. Why are black holes black? Can a huge mass of humanity make the Earth wobble? What’s so bad about space pollution anyway? 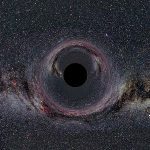 From Dave Johnson: “Why are black holes black?” So, are black holes black? Fraser: They are black, okay why are they black? Pamela: Basically black is defined as the absence of all light. In the case of black holes, light can’t get through them. It can’t come out of them. They just sit there and to use an internet term pwning the light. Light just can’t get away from them and without light being able to get away they can’t shine so they define the absence of light. Fraser: Alright, that’s it. They won’t let light go so you don’t see any light and so you don’t see any color. You just see nothing. Let’s imagine a hundred years there’s ten times – so we’ve got 60-70 billion people and they all move over to one side of the planet would that significantly change the rotation of the planet? Pamela: No. Your typical average not overweight American is about 60 kilograms in mass. The planet Earth is six times ten to the twenty-four kilograms in mass. When I opened up the calculator on my computer and did 60 billion times 60 and divided it by six times ten to the twenty-four, my calculator came back and said zero. It’s such a small percentage of the Earth’s total mass that it has absolutely no affect on anything. Fraser: I think there are probably mountains that weigh more than that. Fraser: You can’t say nothing because everything has an effect. If you did gather that many people over it would have an affect. It would just be impossible to measure. An impossible to measure number wouldn’t throw the Earth out of orbit. Pamela: It would be a negligible effect. It’s sort of like the difference in your mass between now and the half a second from now when a grain of dust has settled on the tip of your nose. Fraser: I think that question of could you throw something out of orbit is even interesting. If you somehow found three more Earths and glommed them onto the size of our existing Earth that would affect our rotation but would it affect our orbit? Pamela: It wouldn’t actually affect our orbit; now if you whacked the Earth with them. Fraser: No, no gently sort of pack them together like a bunch of snowballs. Pamela: Right so say that you had four or six – six is probably a friendlier number – you had 6 more Earth-massed objects that come in and gently attach themselves to the planet Earth. Coming in exactly on the x y and z plus and minus axis so all the momentum cancels out. If you had this miraculous absolutely no transfer of momentum, no forces, everything sums to zero the Earth plus 6 more Earths would continue orbiting the sun exactly the way we’re orbiting it now. Our mass actually has absolutely nothing to do with it. Fraser: So where the mass moves over to has no affect. Nothing can kick us out of our orbit from on the Earth. It would have to be some body hitting us from outside the Earth. Pamela: Right. Some sort of a force would need to be imparted upon the planet with violence. Pamela: Trash into the sun actually isn’t all that bad of a thing in terms of just wow, okay that’s one way to get rid of really nasty polluting awful chemical things. Fraser: That’s also one way to really spend your money. Pamela: Yeah, it’s kind of expensive. It’s also one of these things of eventually we’re probably going to have to mine our garbage dumps to get resources from them. We only have so many easily accessed resources on the planet Earth. Everyday we throw away metal. Everyday we throw away rare elements just in our old cell phones, old computers and even the nails in our shoes when we toss them out. Someday that may be necessary material. If we start shooting all of our garbage off toward the sun, we’re going to be depleting our planet of natural resources. So, yeah garbage is horrible. It smells bad, looks bad and takes up real estate that could be used for other more interesting things. Someday we’re going to need that stuff. Let’s keep it. The organics will recycle themselves, the metals at least we’ll know where they are. Recycling is by far the best thing anyone can ever do. Fraser: I actually did an article about this about a year back. I actually did the math. The U.S. produces 208 million metric tons of garbage every day. I figured out that to launch that would cost about 208 trillion dollars a day to launch the garbage. It worked out to about 5,800 times the United States gross domestic budget just to launch trash into space – all of its trash that it generates. I think the issue is if you fire garbage into the sun, great you’ve gotten rid of it and it is no problem. The sun doesn’t care. The sun has all that stuff already and it will dismantle the chemicals, no problem. It’s outrageously expensive so it’s not really a great idea. I think when they talk about space pollution we really think about the stuff right around the Earth which is colliding and crunching into each other and breaking up into smaller pieces. Really it’s a risk for astronauts. It’s a risk for the vehicles that we launch out. Every time the space shuttle comes back down from space it’s got little nicks and dings. A lot of times they have to move the International Space Station or the space shuttle because some glove is going to be coming within [laughter] a kilometer of the space station and they have to move it a little bit to make sure that it’s safe. The thinking goes that the more junk that gets up there the more cluttered the area is going to be and the more chances there are that something is going to get hit catastrophically. It would really be awful if the astronauts were killed because somebody didn’t clean up their garbage very well. Pamela: A lot of people will say well space is a big place. So are the oceans of the world and any of you who have ever gone out on a ferry or on a cruise ship there is garbage everywhere. It’s really discouraging to for instance when I’ve taken the ferry from Bar Harbor to Nova Scotia, you’ll be out where you can’t really see land and there are soda bottles everywhere. If we can manage to systematically cover our oceans in garbage it’s not that hard to systematically fill the space around our planet with garbage. While a cruise ship versus a soda bottle the ship wins, in space you’re dealing with much larger velocities. That soda bottle-sized chunk of satellite that hits the U.S. space station could destroy it. Fraser: I think the last issue is that a lot of people are worried about spacecraft and stuff from Earth happening to land on Mars or Europa or any of the icy moons around Saturn. The risk here is that life on Earth could contaminate these places. You might get some bacteria that hitched a ride on a spacecraft, made its way maybe over a million years slowly orbiting the solar system happen to crash land on Europa. It might negatively affect the environment there. While that’s a long shot of course, why take chances? Pamela: We are our own worst enemy in some ways. We could create biohazards and go off and start all sorts of interstellar inbreeding of bacteria. Yeah, it’s just not something to do. We avoid it as best we can. Do astronomers use the speed of light as a measurement? I get light years, right? Pamela: Right. In general we use the speed of light to create our meter stick. Light goes this far in a nanosecond, it goes this far in a day, and it goes this far in a year. You know human beings don’t think in terms of the speed of light. We do things like within our solar system we measure things in terms of astronomical units. That’s the distance from us to the sun. We also in space tend to measure things in a distance called a parsec. One parsec is a little more than 200,000 times the distance from the Earth to the sun. Then we just start throwing words in front of it. We have things like kilo-parsecs which is a thousand parsecs. We have mega-parsecs which is a million parsecs. You can still if you dig through the literature occasionally find really silly to my mind references to huge distances measured in centimeters just because the math doesn’t care. Fraser: Right this is the number of ten to the power of 27 by all means do it in meters or whatever. It makes the math easier. Pamela: We don’t generally use feet or miles but everything from centimeters to astronomical units to kilometers to mega-parsecs. All these different things are fair game. I guess because we see all of these galaxies moving away from us the theory goes that this is the result of the big bang and the universe is expanding. How would that be different from these galaxies it’s almost like they’re sliding off a table towards some mass and that’s why they’re pulling away from us? Pamela: We can’t actually tell this difference. This is actually one of the new questions that have recently come up. It’s possible if our universe is small enough and you believe in amazing coincidences. If all the right things lined up we could be in the center of basically a bubble of mostly empty universe. The other stuff in our mostly empty section would be attracted outwards toward things that we can’t see. It’s that gravitational mass of the higher density parts of this giant universe that could exist that things could be attracted to. That could happen. It’s a void hypothesis. I personally have some problems with this because it does require a huge coincidence. It requires that there is a void that we are roughly centered in that’s at least the size of the visible universe. If we’re not centered in it, it’s absolutely huge. It can incorporate everything in the visible universe. Fraser: That would be almost like imagine you took a whole bunch of marbles and you put them on top of a beach ball and held one at the very top and let go of all the other marbles. They’re all going to roll away down the hill of the beach ball. The marble on top is going to say everyone’s moving away from me! I’m at the center of this. That would be true, right? Those marbles all would be moving away from you. That says I guess I’m at the center of the universe. I’m important. Pamela: [Laughter] Right and just the whole coincidence of it all that it is more than just the expansion of the universe. This is actually the acceleration of the expansion of the universe and is caused by this freak alignment. That’s a bit hard to stomach when so many of us have spent our entire careers teaching okay they used to think the Earth was the center of the universe but it’s not. Then they thought the sun was the center of the universe – but it’s not. Then we thought the Milky Way – again it’s not. This would suddenly have us going but we are the center of this giant void. That just is uncomfortable. Fraser: I guess the solution to that then is to very precisely measure the speed that things are accelerating away from us to see if there is some kind of asymmetry. Fraser: Yeah, a lack of symmetry. Then if it is perfectly symmetrical you can feel pretty comfortable that we’re not at the center of anything. If it is asymmetrical then you can say wait a minute it’s kind of weird. Pamela: We need more supernova observations in all directions so that we can systematically recreate the measurements of the expanding universe more importantly the accelerating expanding universe along many different directions. Fraser: Yeah so if you could squeeze energy down you could make a black hole. Pamela: In fact the Large Hadron Collider produces enough energy to do this. That’s kind of cool. We can do this with stuff here on the planet Earth we think. Fraser: Wow, that’s pretty crazy. That’s when they talk about how the Large Hadron Collider is going to be creating black holes. It’s going to be taking the energy of the particles that it’s smashing together and it will generate enough energy in a small enough space that it will in theory make a teeny weenie black hole for a second. Then it will dissipate. It’s not even theoretical, it’s like we’re gonna do it. Pamela: What’s cool is these black holes would, we believe decay very rapidly. This might be that final little bit of experimental evidence that’s needed to give Hawking a Nobel Prize. That would be cool too. I guess could it push you? Could you use it as a little propulsion system if you’re out in space? Pamela: Yes you would just get propulsed – if that’s a word – very, very slowly. In fact you don’t even have to be in space. It’s just here on the planet Earth the friction is a bit much to overcome. Anytime you emit light in one direction you create a force in the opposite direction. This is a serious problem with some of the big mega-lasers that they build here on the planet Earth. We have the pettawat lasers for instance that some of the military and research facilities here in the United States when they fire those lasers it makes the entire building shake. This happens because you have light momentum going in one direction and conservation momentum trying to push the laser in the opposite direction. Fraser: We don’t want to make people do math but what is the calculation that you might want to make for how much force you’re feeling? Pamela: The way to look at it isn’t so much with force as with momentum. You have your energy going in one direction at a velocity you know. Take that energy, convert it to mass using the whole e=mc2 thing. Use the speed of light and get the velocity. Then figure out the momentum of that light going in one direction. Then look at your own mass and solve for what velocity you might end up going in the other direction. It’s kind of sad, pitiful. Fraser: You would be able to calculate at least how much force it’s emitting back on to your laser or your flashlight while you’re in space. Fraser: That’s how a solar sail works right? A light beam striking the solar sail imparts a force as well. Pamela: It’s all in something had to either stop moving or get absorbed and the velocity and the momentum imparted by that had to go somewhere. Okay Pamela, can you explain e=mc2 to an 8 year-old? Fraser: Maybe I should get Chloe to come into the room and have her just like [laughter] watch us and then if she gets it she can give you the thumbs up. Pamela: Here’s how I look at it. Energy and mass is the same thing with a constant. One good way to look at it is if you want to have a bowl of jello you need water and powder. There’s always the same ratio between the jello and the water. The constant that allows you to get from the water to the jello is the box of powder. Jello and water, same thing with a constant that causes them to change basically you go from liquid to mostly solid stuff. With e=mc2 the constant that allows you to figure out how much energy can you get out of this mass is the speed of light squared. It’s just a constant, it’s a special constant but it’s just a number. The way you’re able to figure out how much jello you get out of a thing of water is you have to multiply it by the of powder. Does that work? Fraser: I think I get it but then I sort of went into it. I think what you’re driving at is that matter and energy are two sides of the coin – they’re the same thing. They’re just two different ways to look at it, right? Pamela: There’s always this multiplier of if I mixed water a larger amount with a box and a half of powder I’ll get more jello. You always have to have things in the exact right amounts. If I mix half as much water with the box of powder I don’t get jello. Fraser: Right you get very weak jello. Pamela: [Laughter] You get slime going across your counter. Fraser: Let me take a shot at it too. I think that if you could take matter, anything, sugar cubes and you could convert that into pure energy that would be like nuclear bombs going off. That would be like electricity to run your house. That would be pure energy, rocket launches. The e=mc2 just tells you how much matter, if you take a sugar cube how much energy you’re going to get out of that. Matter, energy, what’s the number? If you have a car it will give you more energy. If you have a sugar cube it will give you less energy. I think the most amazing thing is how much energy, because the speed of light in the calculation is so big. You get an enormous amount of energy out of that transformation. Pamela: Last time I ran the calculations, admittedly New York City was a bit smaller but we were also more energy polluting, but the last time I ran the numbers you could power an entire city off of the energy in basically one potato’s worth of mass. Mark already has a PhD. Pamela: And it’s in the form of engineering. Fraser: In engineering, yeah. Swinburne – we should disclaim that Swinburne is a sponsor of AstronomyCast. Pamela: Also I’m one of their instructors and have been one of their instructors since 2000. Pamela: So we’re fully . Fraser: Absolutely. Working with Swinburne, anything we say about Swinburne should be taken with a kilogram of salt [laughter] which could then be turned into energy. Pamela: All of that said, I keep running into past students at science conferences. They’ve gone off, they’ve done great things. They’re still involved in the community in a variety of ways. They’re mostly involved in the community either teaching at community colleges, working at science centers, working in education and public outreach with a few exceptions. There are some amazing exceptions. The majority of people who go to Swinburne Astronomy Online are getting a degree because they want to do outreach in education work, not because they want to be research astronomers. As someone who has a strong technical and mathematical background a terminal Masters Degree designed to help you teach astronomy to non-majors might frustrate you because it will teach relativity from a conceptual standpoint with math. It won’t go into all of the hard-core math that you need if you’re going to become a researcher in relativity. If you’re looking for the level of mathematical rigor that you’d get in courses that are designed for people who might potentially go on to become researchers in each of those fields versus people who are interested in learning about it and interested in being able to teach things at a popular level and communicate it very effectively to the public so they understand it. If you want that extra level of mathematical rigor, check out your local state university. There are a lot of universities – my own being one of them – that offer their graduate courses as night courses so that the graduate students can teach classes during the day and do research during the day. Fraser: If you already had a PhD in a math-intensive area something like engineering, you’ve got to be pretty close to being able to then turn around and go get your PhD in astronomy or astrophysics. You don’t have to go back from square one, right? Pamela: No but you do need to go back to day one of graduate school. There is a lot of content knowledge where once I hit graduate school I didn’t take any more math courses except on how to statistically analyze my data. That was a very specialized stats cap class. Other than that I was doing things like the quantum mechanics of the interstellar media, evolution of galaxies, stellar atmosphere, and stellar evolution. All of these things from a very detailed take the courses you learn as an undergraduate that are general across all of the physics, astronomy and engineering majors and apply them very specifically to astronomy. There are series of courses that pretty much all astronomers end up taking at the graduate level with varying levels of mathematical rigor depending on what your goal is. People who are going into astronomy education research or education public outreach or people who are going into science communications need enough mathematical rigors to understand the concepts of their core. They don’t need that extra layer of mathematical rigor that you need if you’re then going to be applying those concepts to going in new directions that no one else has ever gone before. It sounds like Mark might be interested in that extra evil step of okay let’s figure out how to do things no one has ever done before. Fraser: Would you think he would have to go back to get a new Masters or do you think he could just start with his Doctorate? Pamela: He’d need a new Masters. Unfortunately in fact astronomy is pretty evil in general where say I had after I got my Masters at the University of Texas had I wanted to go to the University of Arizona to do my PhD, nine out of ten times they’re going to make me redo my Masters. Masters aren’t generally transferable. You start over. It’s kind of sad but that’s the way it is. Fraser: Something like Swinburne might be a little more not mainstream I’m trying to think. There’s more focus on outreach and education and rounding you out to be a better communicator for astronomy and teaching what you’re already doing. You really would need to go back and redo the Masters and redo your PhD switching from Engineering over to Astronomy. That would be like how many more years? Another 2 years for your Masters and another 3+ years for your PhD? Fraser: Another five years at least to get a PhD in astronomy. Pamela: It’s more typically six to eight actually. Pamela: It’s kind of bad. Fraser: Would any of the courses that Mark has with a PhD in engineering be applicable to astronomy? Pamela: At the graduate level? Only if you wanted to build instruments. Fraser: Okay, so, Swinburne or go get another PhD. Rack ‘em up. Pamela: It’s fun. That’s what the astronauts do. Can a photon be slowed down? Pamela: No. They’re quite nice about traveling at the speed of light. There is a caveat here and that is speed of light changes depending upon what media you’re going through. Fraser: Right so vacuum or atmosphere or water a glass or some ruby crystal. Pamela: Yes so if you want really slow moving light shoot it through some sort of Iridium gases. Once you compensate for the fact that the speed of light changes from media to media the speed of light is the speed of light is the speed of light. You can’t slow down photons except by changing what they’re moving through which doesn’t actually change their mass. Okay I guess this is the question that’s like what is a black hole deep down inside? Is it a singularity where mass is continuing to compress down infinitely small or does it sort of gets to some small size and then just stop into some new exotic form of compressed matter? Would there be a difference between whether those things would spin? Do we know that answer yet? Pamela: No we don’t. We do know that black holes can spin. In the case of a singularity, it’s actually they’re dragging space time around. You can end up basically twisting up space time which is kind of cool. What’s spinning is everything. Space, time, frame of reference, everything is getting squinched up and it actually ends up changing the shape of the event horizon depending on how fast it is rotating. Fraser: Black holes definitely spin. I know that we’ve done a bunch of articles about supermassive black holes that are spinning at the limits predicted by Einstein. Einstein said here’s how fast a black hole should be able to spin and what do you know, astronomers have found them. Einstein – right again. They’re spinning but how do they know that they’re spinning? Pamela: We know that black holes are spinning because of the effects of the interface between the event horizon which would be spinning with the black hole and the stuff that’s falling into the black hole. Depending on the rate of rotation of the black hole itself and the frame of reference around it and everything else it’s able to do neat and interesting things to the accretion discs around it. The way to think of it is if you stick a blender into the center of a thing of cake mix – apparently I’m hungry while talking about this episode – if you stick a cake mixer into the center of a thing of non-moving cake batter and you turn it on and start it rotating first the center is going to start rotating. Then frictionally it will cause more and more of the cake batter to rotate until pretty much you get this nice rotating cake batter. It’s rotating faster at the center than it is out at the edges. We see the same thing with material falling into a black hole where at the very center the rate at which it’s rotating has to do with the rate at which the black hole is rotating. Fraser: The fact that we see a black hole spinning doesn’t tell us whether it’s a singularity or it’s some small ball of exotic matter. Fraser: Either one could spin. Fraser: Even if a singularity has no width it can still spin. Yeah we know that astronomy is a great big time machine. Any star that we look at we’re just looking at what that star looked like in the past. If we look for the light we’re seeing the universe as it looked at that point in time. If you’re looking 12 billion light years away you’re seeing the universe just a billion and one half years after it was formed. So, could we see cities on other planets? Fraser: Like not ever, or just not today? Pamela: Probably not ever because this is where you start getting into the finite speed of light problem. You need to have such high angular resolution that you’re starting to talk about putting two different spacecraft so far apart trying to image the exact same thing that it’s no longer really useful. Just trying to communicate with the two satellites, get everything lined up it’s just not going to happen. That said even though we can’t feasibly start looking for individual cities on the surface of distant worlds what we can do even today is start looking at their atmospheres. Right now with little tiny planets we’re not going to really be able to even find them. With Jupiter-size planets that are close enough into their stars we can start looking at their atmospheres and measuring what’s the composition of the atmosphere. We look for pollution. We look for the signs of organics. We look for loose oxygen. We can start looking for planets that when we look at them they’re giving off more light than they should. That might be a way to be able to say aha, I found something that appears to have cities on it. Fraser: Maybe even match it up to additional light to continents and map out the continents. I think once again you’re being trapped by boring reality [laughter] and you’re not really thinking this through to its logical conclusion. It would be hard but not impossible just hard if you filled the solar system with spacecraft and figured out a way timing perfectly to have an image with a great big telescope you could get some pretty cool angular resolution. Maybe you would even see something on Alpha Centauri. Maybe the image of the planet’s surface if there’s a planet there. If you could wouldn’t you be seeing what life was like on Alpha Centauri four years ago? Fraser: It’s done, I just did it. Pamela: Okay. If you can overcome all of those difficulties and get the spacecraft far enough apart yet you could image stuff on the surface of other planets given large enough telescopes. Fraser: You would see it in the past? Fraser: Right and so let’s say that the poor folk on Alpha Centauri for some reason lost their history couldn’t we looking at their planet right now be able to record it and go oh well here’s what happened four years ago if they came and asked us. Pamela: [Laughter] If we knew that we needed to do that. Fraser: If we knew that we needed to, right, of course. Once again information has to travel the speed of light so they have no way to tell us that they needed us to make a back-up for them. The further out we look a hundred light years away we’d be looking at planets imaging their surface a hundred years ago. Pamela: Using an even bigger telescope. Fraser: An even bigger telescope, yeah whatever. It’s the size of ten solar systems whatever. Here, done there I just imagined it so it’s real. The technical problems obviously are staggering, astonishing and a much easier feasible solution is to look for chemical compounds and measure amounts of light and all that. There are some really amazing research articles being done. I try and write these up whenever I see them. They are really cool ideas on how you might recognize that there is life on a world. They figured out ways to map out the continents and the oceans by the reflected light bouncing off of a moon going around a planet. As you say, chemical ways to say if you see this chemical compound it has to be pollution. It has to be an industrial civilization. There’s like no other way that could be in the atmosphere of that planet. You don’t need to see a city. You don’t need to see a car if you see the right pollution in the atmosphere which you could see with a telescope then that’s all you need to know. There are cars, alien space cars but it’s got to be pollution. Pamela: They’re burning up the same nasty hydrocarbons we’re burning up here on Earth. Fraser: Then someday they’ll build some ridiculous telescope and really be able to see even better and better. They’ll just look further and further out. I think we’ve run to the end of these questions so we’ll talk to you next time Pamela. I just heard Dr. Pamela Gay say she once did a calculation and determined that New York City could be powered by “one potato” turned into energy (according to E=mc2. But wait, Dr. Pamela Gay is a scientist and scientists know that units matter. New York City is continually drawing power, and could theoretically use two potatoes or a whole bag of potatoes worth of energy if it needed to run for a long enough time. What I’m saying is she left out an important parameter: time. For how much time would a potato, converted to energy, power New York City. You left that out and I want to know! Great show! Geran Smith, I’m sure you realize the genesis of “pwning” was people who misspell owning because the O is next to the P on the keyboard. Some guy who didn’t want to say he’s wrong just kept using it and saying its just an uber cool term. Once “pwning” was out there, all the kids who had no idea what it was because it wasn’t on their 3rd grade spelling test, in order to save face to the people who had heard of it, started actually saying Pwning with the P. Thus through evolution, today the P is pronounced and it is now verbalized with the P and the O (even though they still won’t spell it with the O) and sounds more like P-owning. Such a wierd topic for this forum but I gotta back up mah girl!!! Hey Guys.. pamela my Question about the E=MC2 and the 8 year old explanation was great, My son seamed to get it but it confused the hell out of me the first time I listened to it…. Great explanation and keep those Pod Casts coming…. I haven’t done the math myself, but since the issue has been raised of the theoretical energy content of a baked potato and the length of time it could power a large city, and since the present global civilization’s understanding of its energy predicament is (in my opinion) roughly on the level of a child’s belief in Santa Claus, it may be useful to reflect on how present-day cities are actually powered. To this end, I submit the following consciousness-raising quotations, extracted from my “Who’s Talking About the Peaking of World Oil Production – and What They’re Saying,” posted at Global Public Media. The latter two concern the case of Atlanta, GA.
–Matthew Simmons, Chairman of Simmons and Co. International energy investment bank, in lecture at the Miller Center for Public Affairs, University of Virginia, November 30, 2005. One of the sad implications of our energy predicament is arguably that as a civilization we will not long have the capacity to continue the sort of researches typified by the LRC and the HST. Isn’t it time that this became a topic of discussion among scientists? Sent this off in a hurry before work. Of course I meant LHC.